Contest: How Much Wood for Outdoor Wood Boiler? How many days to burn the row pictured? 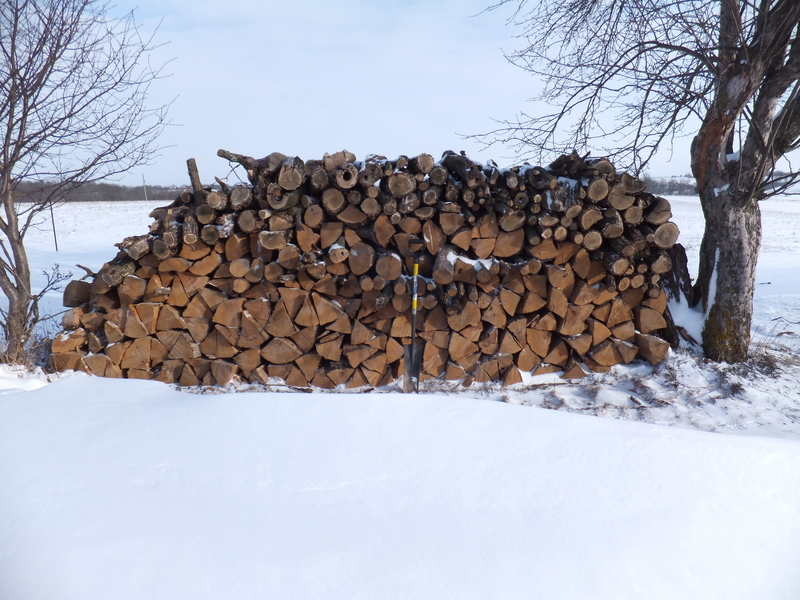 The dimensions are about five feet tall, by sixteen feet long, by sixteen inch logs. This is about eighty percent of a cord of wood which is 128 cubic feet, the industry standard for firewood. It’s mostly dry oak, although it was rained on the day before I took this picture. And now another winter storm has dumped snow on it, but it still burns well. You can look at this old post for hints. Also notice the changing color of the lawn. I’ll start burning this row February 1st. You have a week to guess in the comments. The prize for the closest guess is negotiable. In the past I have given gift certificates to Kiva, and meat. Good luck! I hope my old friends guess. I also hope some of the newer visitors will guess and introduce yourself. Ever since Bruce King put my blog on the sidebar of his excellent blog, I’ve had more international visitors. Bruce raises chickens and hogs on some highly fertile bottom ground in the state of Washington. He also recently purchased a confinement dairy farm. 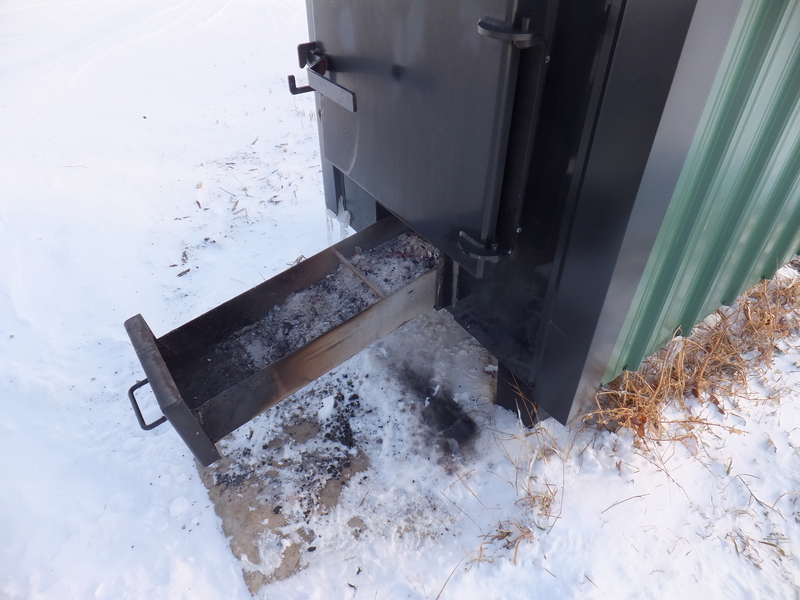 Click on this link if you want to read more about my Outdoor Wood Boiler. Below is a photo of the ash pan. That is the amount of ash after two days, which is about how often I remove the ash. This entry was posted on Friday, February 1st, 2013 at 1:33 am and is filed under Curious farmer, Curious living. You can follow any responses to this entry through the RSS 2.0 feed. You can leave a response, or trackback from your own site. 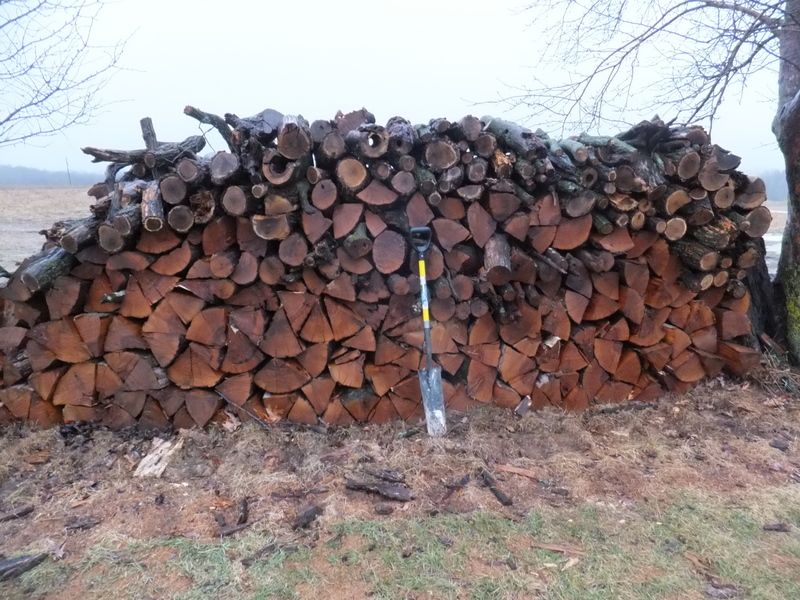 13 Responses to Contest: How Much Wood for Outdoor Wood Boiler? I’d guess that this will be about 17 days–at least if you burn wood like my family does. I recall that last time the wood burned quickly, so the guess is for seven days. I am guessing 20 days if it stays pretty cold. One more rule for those of you who are waiting to guess: Once a day is taken, it’s taken. Also, where are your guesses Canada, United Kingdom, Argentina, Spain, Croatia, Australia, Norway, Costa Rica, Indonesia, and Philippines? I want to meet you. This is great! Brgy is a Calvin and Hobbes fan. Doug is one of my oldest best friends. We’ve written and performed music, traveled together. And Gordon and Walt are farm bloggers who I now follow. Thank you for introducing yourselves and leaving a link. 30 days for the eclectic Toasted Tofu from Scotland! Wait, how many days did you mean, Toasted? For some reason I think of a month as 30 days. 24 more hours to make a guess. Don’t be shy. 14 days I would think. Oak burns really hot but tends to go pretty fast I think. I am curious to find out though. How are the cattle holding up in this up and down weather? Are the cows doing ok with the mud and snow? Just wondering. Also wondering how things worked out with midwest bio-ag? Have a good rest of the winter hope everything goes well. Thanks for your guess, John. Cattle are fine. When I was looking at doing something with MBA I ran out of money, and then the guy I was working with, Justin, went out on his own so I decided to work with him. We took soil tests this past fall and put on some phosphorous, potassium, sulfur, and calcium. I guess I should write a post about it. Hope you’re getting through the winter. Spring is coming.